Cologne Business School is inviting applications for Foreign Student Scholarships. These scholarships are designed exclusively for new international students (Bachelor, Master and full-time MBA) who intent to study at Cologne Business School. Application Deadline: June 15, 2017. Cologne Business School GmbH is a private business school established in 1993 in the city of Cologne, Germany. The business school is a state-recognized university of applied science and conducts research in many fields.Proof of English language proficiency (if English is not student’s first language) through TOEFL-certificate (min. 92 points Internet-based) or IELTS (min. Band 6.5); both not older than two years. Course Level: Scholarships are available for pursuing bachelor, master and fulltime MBA programme. Scholarship Award: CBS awards scholarships in order to reduce the tuition fees for talented foreign students. The level of the scholarship (25%, 50% and 75% of the tuition fee) mainly depends on the skills and the financing need of the applicant. Nationality: International students are eligible to apply for Foreign Student Scholarships. 1. Bachelor Programme: Requirements for admission to study at our university include general matriculation standards for entering a higher education institution or advanced technical college entrance qualification. Equivalent certificates from foreign schools shall also be recognized accordingly. Comparable certificates include, for example: High School Diploma, Matura, A-Levels, Bachillerato or International Baccalaureate/IB Diploma. Should no school leaving certificate/diploma be available, the last certificate you received may also be submitted. 2. Master Programme: The admission requirements for our CBS Master programmes are a first academic qualification (Bachelor of Arts, Diploma, Master of Arts) with a minimum of 180 ECTS-Credits of a recognised German or international university, university of applied sciences or university of cooperative education with a final grade of at least “good”. Applicants who have not attained this grade in their first study course must take a separate entrance examination. The degree should be business-related. Essays that do not follow the rules set out in the CBS Style Guide, will not be considered for the scholarship! 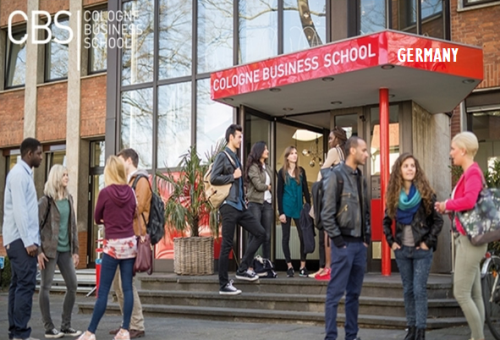 Now that all the information about Scholarships for Foreign Students to Study at Cologne Business School has been delivered nicely; talented students who are eager to pursue their Shell Free Tuition/Scholarships/Study in Germany for Undergraduate, Bachelors, Postgraduate, Masters, PhD, Associate Degree and Other Degrees, can apply now.